I've decided to create my first link-up in the hopes of spreading some positivity in 2016. I am a firm believer that our attitudes about the world have a significant impact, not only on our own lives, but also the lives of those around us. They say that misery loves company, well, so too does happiness. It's also well known that the better your attitude, the happier you'll be. I have seen a number of people writing about their word for 2016 and I have decided, quite easily, mine will be gratitude. I'm so glad you asked. The past few months I've let the lack of sleep get to me and I have often been grumpy and negative. I have been irritable and snappy. Truth: I've been a miserable biatch a lot of the time. I know that, because of this, I have missed a lot of beautiful moments. I know that there were moments I was too miserable to savor or even enjoy. I haven't liked feeling like this and while I may not be able to completely control the amount of sleep I get (the little man is definitely my sleep dictator at the present time), I can control my attitude and it certainly needs an adjustment. I want to be a happier person. I want my family to enjoy being around me more and I want to be present and enjoying the beautiful moments that life has to offer. What's the best way to adjust your attitude? Start making time, deliberately, to be grateful. When 2016 comes to a close I hope to be able to say that I was more grateful and that I delighted more in things and moments I have been blessed with. 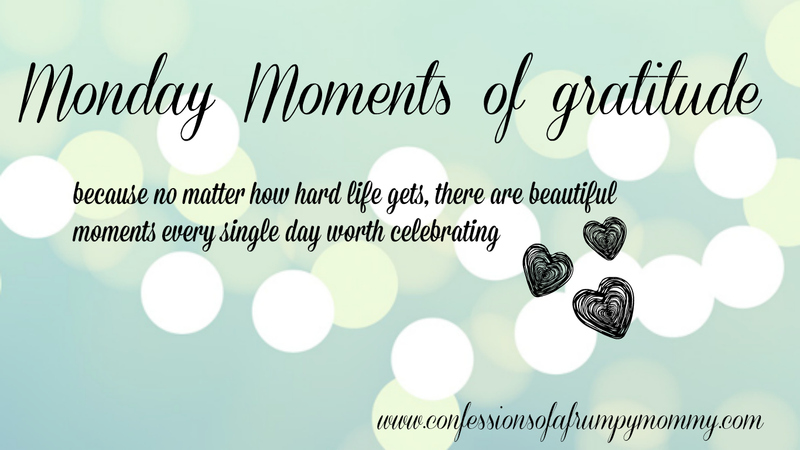 Sooooo.... Mondays I'm going to try to remember to share with you my moments of gratitude and I hope you will join me in sharing your grateful moments each Monday via my linkup. This gives us all a chance to see into each other's worlds but also, and more importantly, to give a little more positivity to a world that can be so consumed with negativity. Bonus: it can be a super quick blog post, just summarize a moment/person/thing you were grateful for in the past week. Easy peasy! AND if you're as busy as I am, easy posts are the BEST! Just the act of writing these posts, will cause us all to pause and reflect on the things that have brought happiness to our lives lately! I'm going to wait until next week, January 11, to start the first link-up, so mark it in your bloggy calendars!! SNUGGLES!!! Oliver had just woken up and was cuddly. I went to take a pic and Annabelle just had to get in on the action. They were both so happy and sweet in this moment I knew I had to capture it. I remember feeling tired and overwhelmed but in this moment I was thinking "I am so very lucky". I love this picture because every time I look at it I know I'll remember that feeling. Oliver and Annabelle had just had a bath and I laid Annabelle down beside Oliver to get her dress (and keep him entertained). She turned over and started talking and they both just starting laughing so hard. My heart was bursting with such pride and adoration for these sweet littles in that moment. I am grateful for this moment but also to have captured it as I know this picture will warm my heart for years to come. Seriously, how great is this picture?! I'm so grateful that these two are becoming little buddies. I can't wait to see what you're all grateful for next Monday!! !